23 March 2019, Pro Life March was held in Chisinau and other places in Moldova, joining the increasing world-wide movement fighting against abortion. 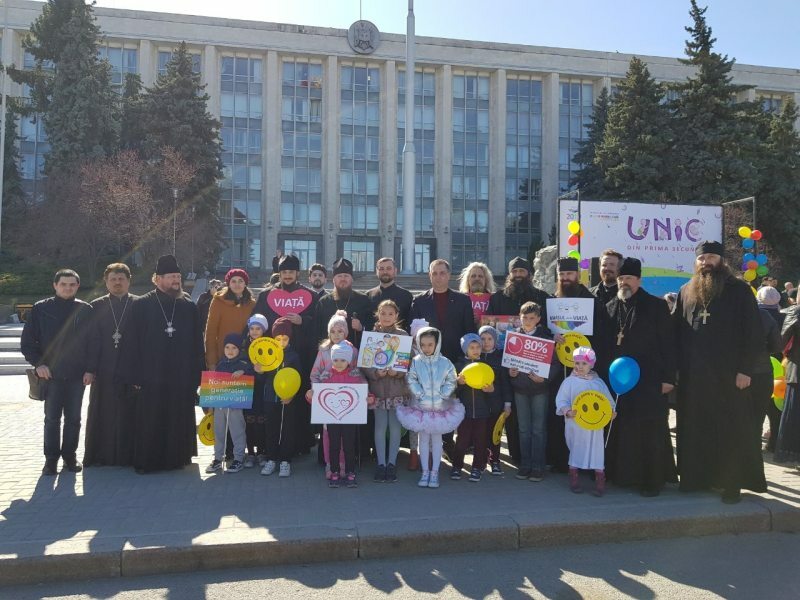 With the blessing of Metropolitan Vladimir of Chisinau and Moldova, Vicar Bishop Ioan of Soroca participated in the action, supported by clergy and laity of the Orthodox Church of Moldova. The March started with a prayer at Municipal Hospital No. 1, and headed to the Square of the Great National Assembly, supporting fundamental values of life, family, and abortion outsourcing. “Unique from the first moment of life means that the moment when the two cells united can be, basically, considered beginning of a new life, according to the teaching of the Orthodox Church. God puts soul into this embryo, into the new growing person. A human being becomes so in the very first moment of conception. God placed into each of us so much love, that even if there is so much diversity in us, we are all unique” – said Bishop Ioan. The event closed with a charity concert. Pro Life March is organized for the 5th time at the national level in Moldova. The movement started in Washington DC, on 22 January 1974.